Driving in the winter months can be a dangerous activity, especially as the weather conditions take a turn for the worse. 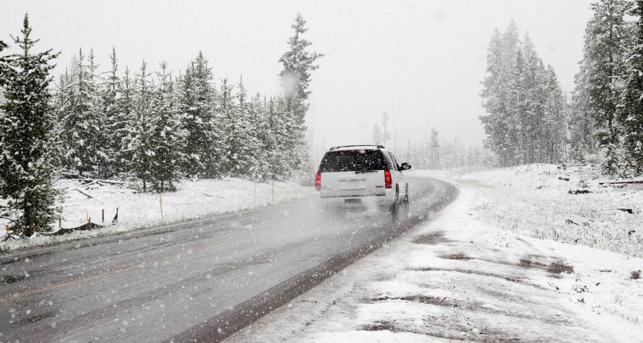 Our list of tips below should help to keep you and your car safe this winter. Preparing a survival kit for your car over the winter months is a good idea. Some items may sound a little strange to keep in your vehicle but you never know when it’s going to come in handy. The best place to start is with an ice scraper for the icy mornings when you’re in a rush. If you don’t already have them, you should purchase a first aid kit, torch, jump leads, and tow-rope in case of emergencies. Keep a coat and some sturdy footwear, such as boots, in the back of your car and don’t forget those sunglasses for the low winter sun as well. Carrying extra food and water in the car is never a bad idea and is essential to keep you hydrated and fed in the event of a breakdown or bad traffic. Making sure your vehicle is fully functioning is crucial to avoid breaking down in the first place. Before setting off check your battery, wiper blades and brakes; getting your vehicle fully serviced before winter is the best way to stay safe. Along with the above make sure you have clean and working lights. After all, it is nice to know that you can see and people can see you. Make sure your indicators, brake and fog lights are clean and functioning. Checking the weather forecasts, especially before a long journey, is essential. If the weather is expected to be really bad it is best to delay your trip until it is safe, however, this isn’t always possible so as Sergeant Phil Esterhaus of Hill Street Blues fame said…be careful out there. The legal minimum tread depth for tyres is 1.6mm. However, The Royal Society for the Prevention of Accidents (RoSPA) recommends you have a minimum of 3mm which is why our lease vehicle tyres are changed at 3mm. Having low tread can cause your car to skid more easily in adverse conditions so check regularly and get in touch with our team when they reach 3mm. These key tips should help to keep you and your car in tip-top condition this winter, however, if you have any other tips for safe travelling in winter let us know via any of our social media channels. Safe driving!